It applies to Bing, Cortana, MSN, Office, OneDrive, Outlook.com, Skype, Windows, Xbox and other Microsoft services that display this statement. References to Microsoft services in this statement include Microsoft websites, apps, software and devices. That’s Bing on the web, Cortana on your phone, Skype on your desktop, etc. 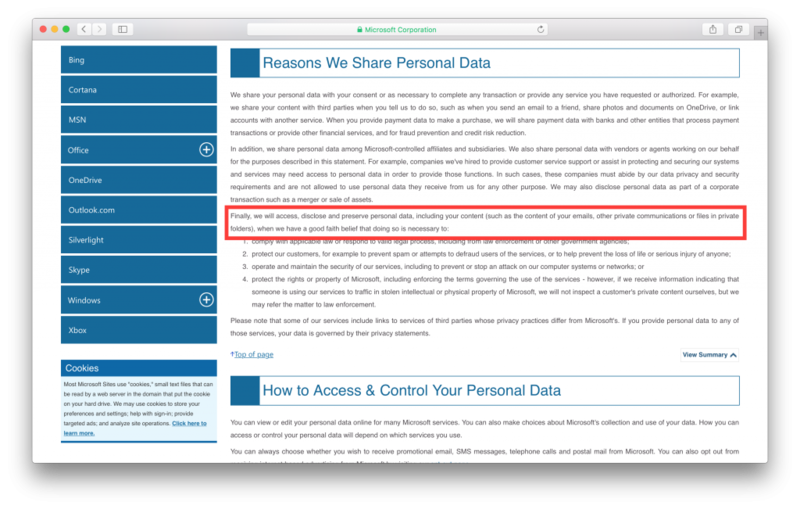 Basically, if you use any Microsoft product that lives in or talks to a “cloud”, there’s no way of getting away from this; is there a rational individual on this planet who would knowingly opt in to such a massive invasion of privacy? Run GNU/Linux. Run BSD. Hell, even run Mac OS X (as long as you don’t do any iClouding). Just do yourself and stay away from Microsoft products. While I’m not sure how long this privacy statement has been public or if it has had other iterations, the site currently states that it was last updated July 2015. August 8, 2015 April 2, 2016 Alan OrthComments are off for this post.